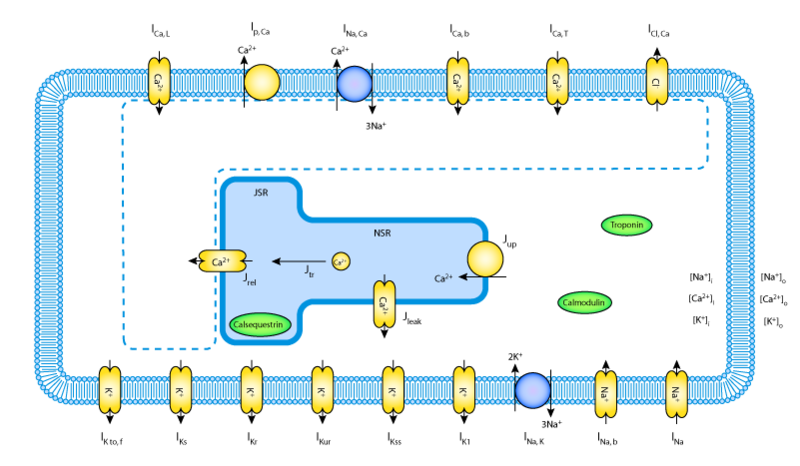 This CellML model is known to run in OpenCell and COR to recreate the published results. The units have been checked and are consistent. ABSTRACT: Therapies for heart disease are based largely on our understanding of the adult myocardium. The dramatic differences in action potential (AP) shape between neonatal and adult cardiac myocytes, however, indicate that a different set of molecular interactions in neonatal myocytes necessitates different treatment for newborns. Computational modeling is useful for synthesizing data to determine how interactions between components lead to systems-level behavior, but this technique has not been used extensively to study neonatal heart cell function. We created a mathematical model of the neonatal (day 1) mouse myocyte by modifying, on the basis of experimental data, the densities and/or formulations of ion transport mechanisms in an adult cell model. The new model reproduces the characteristic AP shape of neonatal cells, with a brief plateau phase and longer duration than the adult (action potential duration at 80% repolarization = 60.1 vs. 12.6 ms). The simulation results are consistent with experimental data, including 1) decreased density and altered inactivation of transient outward K+ currents, 2) increased delayed rectifier K+ currents, 3) Ca2+ entry through T-type as well as L-type Ca2+ channels, 4) increased Ca2+ influx through Na+/Ca2+ exchange, and 5) Ca2+ transients resulting from transmembrane Ca2+ entry rather than release from the sarcoplasmic reticulum (SR). Simulations performed with the model generated novel predictions, including increased SR Ca2+ leak and elevated intracellular Na+ concentration in neonatal compared with adult myocytes. This new model can therefore be used for testing hypotheses and obtaining a better quantitative understanding of differences between neonatal and adult physiology. Schematic diagram of the neonatal mouse model. Derived from workspace Wang, Sobie, 2008 at changeset e46c3504eb74.